The Samsung Galaxy Note5 is the new kid on the phablet block: a 5.7-inch phone that showcases the best of Samsung’s innovation including the latest Super AMOLED panel and a Samsung Exynos-branded system chip. It’s only natural that it gets compared to the device that Google itself used to debut stock Android 5.0 Lollipop on a phablet - the even bigger Google Nexus 6. 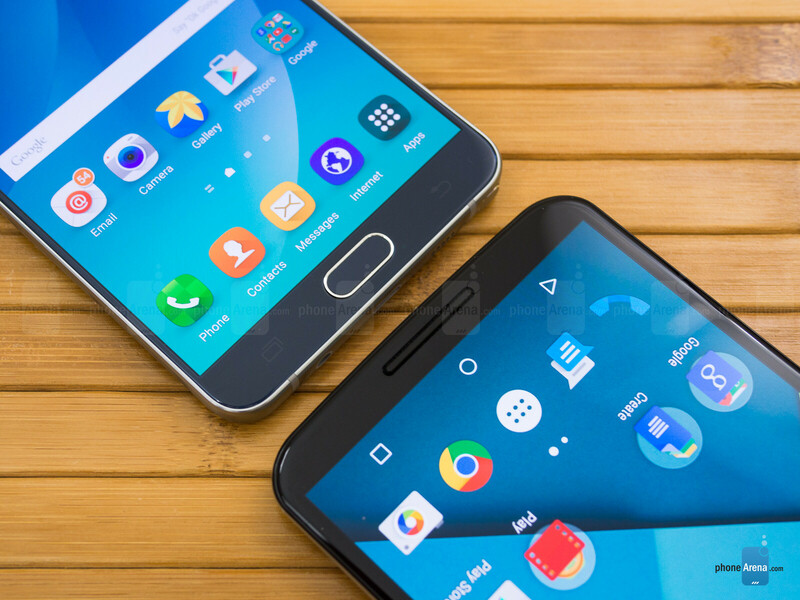 Both are superficially similar in terms of display tech, as they come with AMOLED screens, but apart from that, it’s all about the differences: Samsung’s TouchWiz against stock Android, the modern Samsung glass and aluminum design versus a more conservative plastic back, and two fairly different cameras. 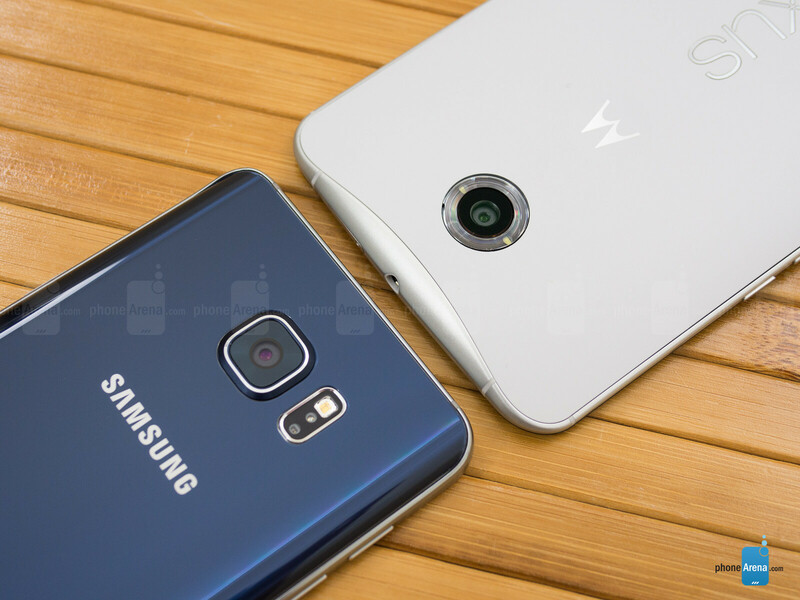 At the end of the day, though, one may wonder: which is the overall better phone? We take a deeper look of the features and performance of the two to find out. We love the sleek, stylish new design of the Galaxy Note5, which is a huge factor in making the device easier to use. The Nexus 6 is not in the same league - it feels too big, and its plastic back gets messy easily. The Galaxy Note5 features the new design language that Samsung introduced with the Galaxy S6 earlier this year: a metal frame sandwiched between two pieces of tempered glass, and all of that feels solidly put together, thin, and good-looking, making for a true premium phone. The Google Nexus 6, on the other hand, is much less refined: it features a metal frame and is also put together with no moving parts, but its back is made of plastic that catches fingerprints so easily that the whole phone turns into a gigantic mess after a few minutes of use. When it comes to size, Samsung has done a great job on making the large, 5.7-inch display of the Note5 fit in a relatively compact body for this size: side bezels are extremely thin and the device has a slight curve on its back, so that it fits more comfortably in your palm. 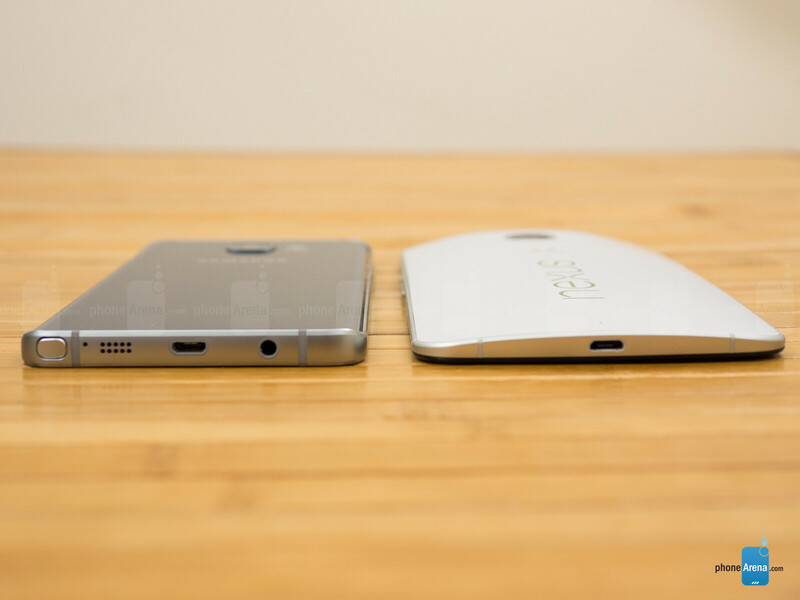 The Nexus 6 - in stark contrast - is large and feels large. The 6-inch giant barely fits in a single hand. As a matter of fact, it’s hard to even fit in a pocket, and while we’re all used to seeing big phones, the Nexus 6 remains on the extreme side of things, and it will definitely feel uncomfortably large for many people. In terms of buttons, there is the signature Samsung physical home key on the Note5 (with integrated touch-type fingerprint reader) with two capacitive keys, and then you have a power/lock key on the right and two volume buttons on the left hand side. The Nexus 6, on the other hand, lacks a fingerprint scanner, and uses on-screen navigation buttons. This being a Note series phone, it also comes with a new and improved stylus. In terms of pure mechanics, you can now gently press the slightly protruding tip of the stylus and it automatically pops up thanks to a new, built-in spring mechanism. A neat little touch! The Nexus 6, on the other hand, lacks a stylus. The 5.7-inch Quad HD screen on the Galaxy Note5 shows the best of Super AMOLED: a bright display with a very well calibrated ‘Basic’ mode. The Nexus 6’s 6” Quad HD screen is also AMOLED but pales in comparison. Samsung has been improving its AMOLED displays at an amazing pace, and while just a year and a half ago there were severe issues with color quality, these days AMOLED screens on top Samsung phones look much, much better. The Galaxy Note5 is no exception with its 5.7-inch Super AMOLED display with Quad HD resolution (1440 x 2560 pixels). The Google Nexus 6, in comparison, also comes with a Quad HD resolution and AMOLED tech, but the actual quality of the display is vastly worse. We’re not talking about sharpness here: both screens use the Diamond PenTile matrix, and appear very sharp and pixelization-free (pixel density is 515ppi on the Note5 and 490ppi on the Nexus 6). The difference is in color reproduction. The Samsung Galaxy Note5 comes with the option to switch between different screen modes: ‘Adaptive’ is the default mode, but for most accurate color reproduction the ‘Basic’ mode remains the most appropriate choice with its adherence to the sRGB standard. In simple terms, sRGB is the color space of everything on the web and on Android, and that’s why it’s important for phones to support such a calibration profile. Unfortunately, the Nexus 6 does not adhere to this color standard, with colors that look plain weird: oversaturated and unrealistic, something that is especially noticeable when you look at skin tones that look carrot-orange, but it really is an issue that affects all colors. The Note5, on the other hand, has a well-calibrated display with whites that are near the reference 6500K temperature, with accurate colors and gamma just slightly south of the 2.2 reference value at 2.09 (such a lower gamma may result in slightly washed out images). Those values are way off on the Nexus 6, as you can see in the table below. Brightness reaches a very high 470 nits at its maximum on the Note5, while the Nexus 6 is noticeably dimmer at a peak brightness of just 270 nits. This translates into one key advantage for the Note5 - its screen is much more legible in outdoor use. Keep in mind that with AMOLED screens, brightness varies depending on the colors displayed, and these are values that we have estimated by measuring an all-white image. Finally, we should also note that viewing angles are excellent on both devices. I'd say the Note 5 is better but I will still buy the Nexus 6 because of that critical s pen design flaw. Also saving some bucks doesn't hurt. WTF. You are not getting a working flawless stylus in Nexus 6 either. Why would you even insert the S-Pen in the wrong way? :/ It's so easy to feel the S-Pen whether it's facing down or up. 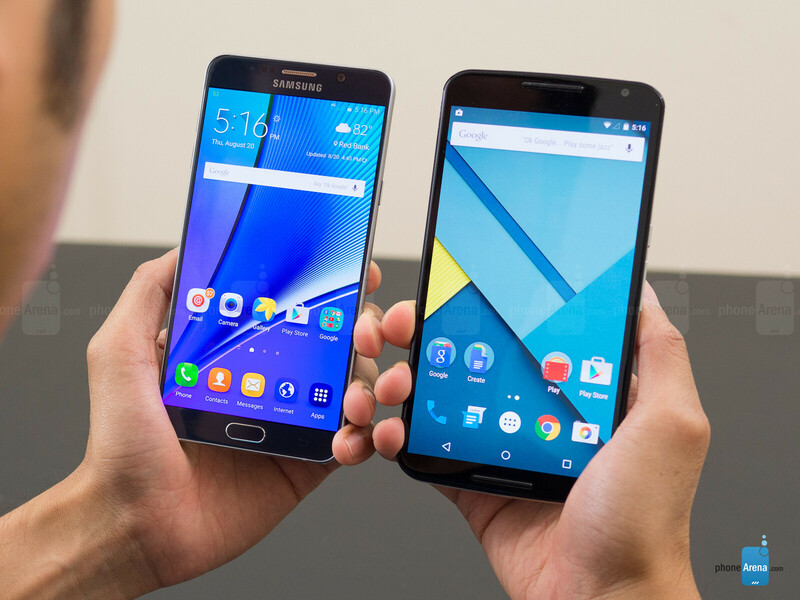 Pretty much the same results from last year between the Note 4 vs N6. I still choose the Nexus in the end because of stock Android and modding freedom. An GPE Note 5 would be perfect. Hopefully the 2015 Nexus 6 will deliver. The different not even noticeable for a 4 gig of ram compare it to dated G4 Soc and ddr3 ram. 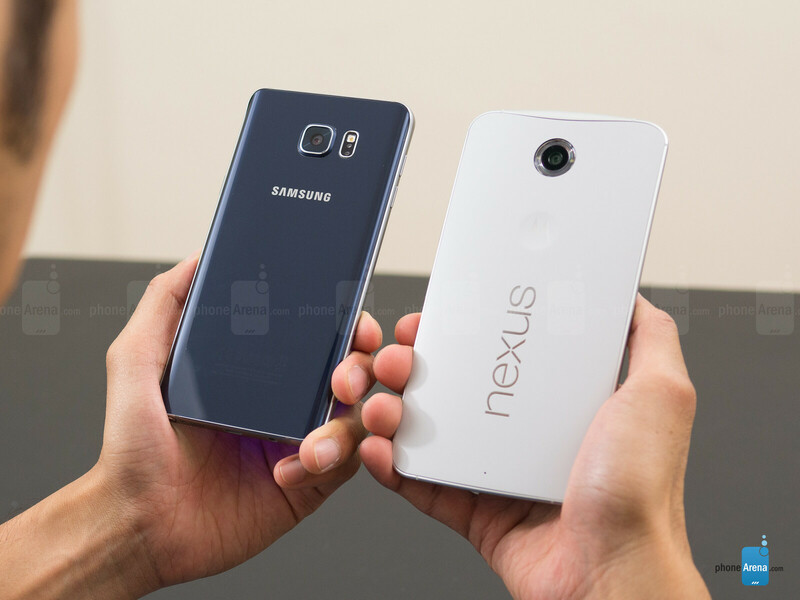 The Nexus 6 cannot even be compared to a Note 5. The only thing that is better in Nexus 6 is faster updates. Even the UI of touchwiz has improved a lot after the option of theme customization (especially the material dark theme). You're right, I wouldn't compare a great phone like the Nexus 6 to the Touchwiz ridden overpriced abomination called the Note 5. Haha! Yes! I've always disliked TouchWiz UI. When I had my SGS3 in 2012, I've flashed a custom ROM on it as soon as devs had a version for the device. I don't know what buyers really are paying for for Samsung devices, overpriced, doesn't really have that premium feel as what you would expect on an iPhone, so much gimmicks with the features and barely gets updates, well at least with the Nexus 6 you get Google stock experience which means uhm, EVERYTHING! Better screen Better camera Better processor Faster storage and more RAM Better design S Pen and all of its functionalities As I said, the only thing good about Nexus 6 is faster updates. I am not a fan of the TouchWiz UI but that is subjective. Besides, the theme has made it at least more pleasing than before. You can say whatever you like but you can't deny facts. Stop comparing phones based on the brand name printed on them. Try and analyse the facts and appreciate good technology. LOL at the "design flaw" in the Note 5. Unless you are holding the S-Pen upside down, you aren't going to put it in wrong.